An abdominoplasty or a Newport Beach “tummy tuck” is a common cosmetic procedure used to remove excess skin and fat from the area below the belly button. For my abdominoplasty in Newport Beach, I tend to use an excision pattern common in Brazil because I believe that the final contour of the abdomen and flanks (love handles) is far superior to the traditional excision pattern used in the United States. In addition, a new belly button is made and I make several types depending on patient preferences. Your new belly button can be vertically oriented and/or have a hood at the top, which looks very pretty and natural. Patients that are good candidates for this procedure have gained and lost 20-30 plus pounds from natural weight variance or pregnancy. As the weight is lost the skin unfortunately often does not contract back to its original state and there is an excess of skin that no amount of exercise will get rid of. In addition, this weight gain often leads to a rectus diastasis, or laxity of the abdominal muscles. During the procedure, these muscles are brought together to not only tighten the core, but also to narrow the waist and to give the body a more aesthetic shape. Pregnancy or significant weight loss can lead to excess skin hanging around the mid-section, stretch marks and loose abdominal wall musculature. 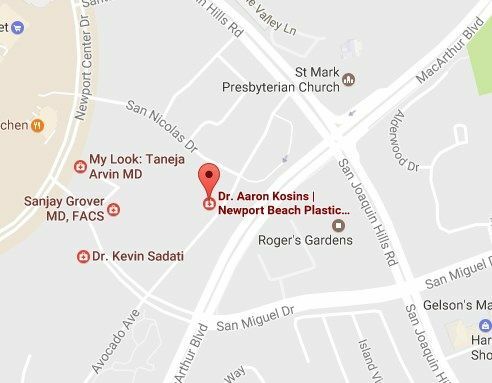 As one of the specialists for tummy tucks in Newport Beach, Aaron Kosins, MD provides tummy tuck surgery to correct this problem. Also known as abdominoplasty, the procedure is a highly successful way to reduce the waist circumference and create a flat, lean tummy that looks amazing with dramatic results! This is not a difficult operation for a Plastic Surgeon to perform and get a mediocre result. What I mean by this is that by removing excess skin and fat, the patient will look better. However, getting a phenomenal result requires surgical skill, planning and operative time. Too often I see scars that are very high, unattractive belly buttons and patients who remain with a cylindrical shape. The patient looks better than before the operation, but the shape is far from ideal. I make every effort to hide the scars in your underwear lines, to create an hourglass shape and a beautiful abdominal contour. This is what separates an average “tummy tuck” in Newport Beach from an excellent one. An abdominoplasty or “tummy tuck” is done under general anesthesia in an outpatient center. I often do this concominantly with liposculpture and/or breast procedures. Depending on the extent of your surgery, some patients go home the same day and others spend the night at Newport Beach Surgery Center for monitoring. It is imperative that patients begin getting out of bed and walking the night of surgery so I take several measures to assure adequate pain control including pain pumps and specially formulated nerve blocks. A Mommy Makeover is essentially a “tummy tuck” combined with a breast procedure (breast augmentation and/or breast lift) and often liposculpture. This term is used because after childbirth, women sometimes have laxity of their abdominal skin and musculature from pregnancy as well as breast deflation because of breastfeeding. I use this combined procedure to restore volume and shape to the breasts as well as contour and shape to the abdomen. The entire torso from the armpit to the hips is sculpted. My experience is that many women after having children really miss the body they had before childbirth. The comment “My kids destroyed my body,” is something that I commonly hear. Each patient is different and not all women need the combined procedure. Depending on your particular concerns the operation is tailored to meet your needs. In some cases, it is important to stage the operation to get a better cosmetic result. For a more comprehensive explanation of each procedure, please see the pages on Newport Beach abdominoplasty, breast augmentation, breast lift, and liposculpture. This combined procedure is performed in an outpatient setting and depending on the extent of surgery some operations are done as outpatients while others are kept overnight for monitoring. Recovery really depends on the extent of the Newport Beach Tummy Tuck and other procedures and the amount of downtime that the patient is willing to accept.